My name is Rebecca and I am a holiday-o-holic. Ask anyone and they will tell you I am only happy when planning a holiday, heading abroad or booking my next adventure. But there is one major problem which goes hand in hand with this addiction – time. Unfortunately holding down a busy job does not allow me to jet-set across the globe at my whim. So following my last trip to Barcelona (the place I call my spiritual home), I decided I was going to take heed of how the Catalans do things and start acting like a tourist all year round. I vowed I would start trying to make the most of what is on my doorstep – and maybe further afield. So to start off, my boyfriend and I headed out in search of some sun, sea and culture 80 miles away at the beautiful coastal town of St Andrews. Ashamedly, despite being born and bred in the north-east, I had only stopped off there once before and I was keen to see what the student hub had to offer. I wasn’t disappointed. 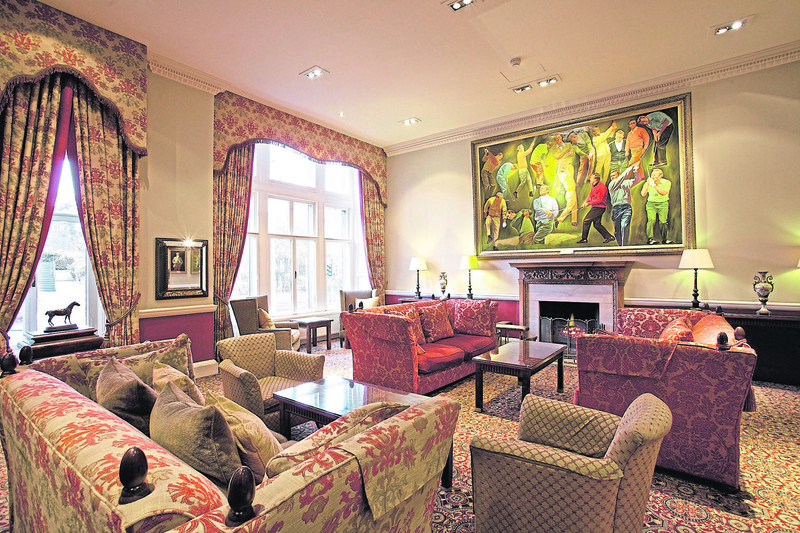 It was a cold February night when we arrived at the Macdonald Rusacks hotel, but the roaring fire at the entrance was welcoming and homely. Having headed there straight after work, we were keen to get out and explore the town as soon as possible to make the most of our weekend away. 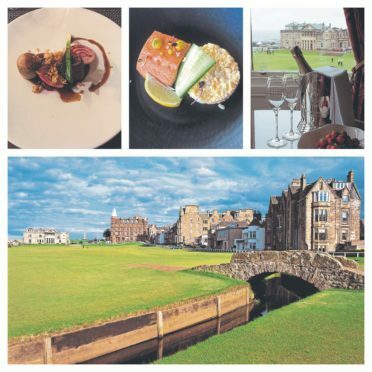 After dropping off our bags in our luxurious suite, which overlooked the Old Course, we took a short five-minute walk into the centre to see about grabbing a bite to eat. Having asked for a few recommendations before we left, we headed for Forgans for the complete Scottish flavour. Alongside our dishes of traditional fare, including a delicious Cullen Skink, we were also treated to a spot of ceilidh dancing as a band took to the floor and encouraged diners to take a spin. After a few hours of good food and entertainment, we headed back to our suite, which was big enough for us to relax in front of the TV in our own private sitting room with a bottle of wine. It was not until the next morning that we really appreciated the value of where we were staying. On drawing back the curtains, which covered a large bay window, we were delighted with the stunning view over the 18th hole. After getting ready for the day in our “loo with a view” we headed down to the three AA rosette restaurant Rocca for our breakfast. The menu was extensive and catered for everyone, whether they are looking for a bowl of porridge or a full fry-up. What was evident from the menu was that local and Scottish produce was a priority with details of the ingredients listed for all to see. I decided to tuck into John Ross Jr Smoked salmon and scrambled eggs, which was delicious and the perfect thing to set me up for my day ahead which was about to involve a lot of gin. 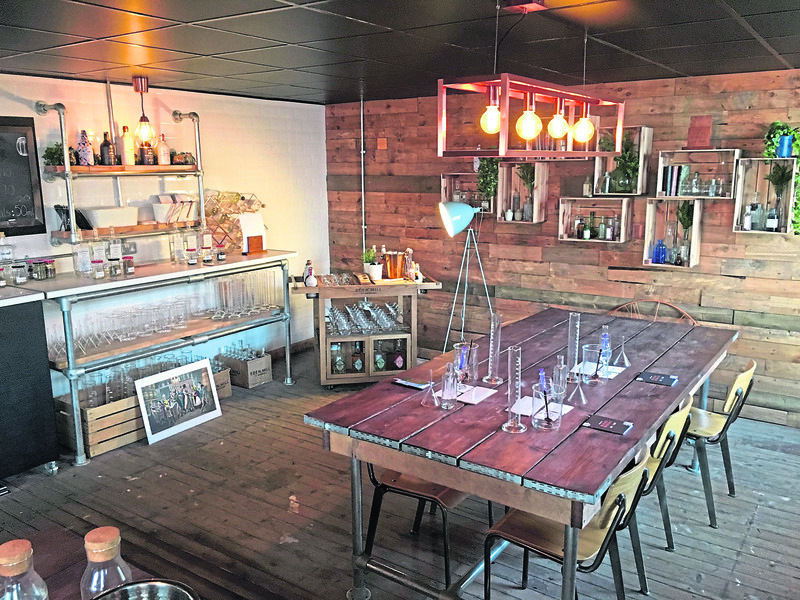 With St Andrews being home to not just golf but the Eden Mill distillery, the brewers have teamed up with the Rusacks hotel to provide consumers with the ultimate place to go and create their own gin. Nestled in the basement of the hotel, the newly kitted out hipster-esque facility houses the experience which lasts around three hours and treats you not only to lots of booze but a whole load of knowledge about the brand too. As well as being able to mix your own flavoured spirit, the package allows you to bottle it and take it away too, along with some souvenir glasses. Following a few hours of drinking, we decided to take a stroll along the seafront to blow away the cobwebs and build up an appetite for dinner, and luckily the hotel couldn’t be any closer to the beach with its beautifully clean blue water. Had it not been around 4C I may have been able to mistake it for the Catalonian coast. Our Saturday was topped off by an excellent meal, again in the Rocca restaurant. My starter of foie gras veloute, orange, golden raisins and spinach powder was like nothing I have ever tasted before. On first reading of the menu I was unsure about the combinations. However, it was delicious. For my main course I opted for a loin of Highland venison, game pudding, salsify, beetroot and a celeriac crisp while my other half tucked into a juicy steak. I honestly cannot remember a time when I have had a better meal in Scotland and my boyfriend said the steak was one of the best he has ever had in his life. I am not normally one for desserts, but the food had been so good I had to indulge, so I finished off the meal with chocolate mousse, popcorn and mint chocolate ice cream which was also to die for. Delicious, smooth and just enough to satisfy a sweet tooth at the end of a three-course meal. Finishing off our indulgent weekend on the Sunday we decided to treat ourselves to the hotel’s afternoon tea in the bar overlooking the Old Course and the sand dunes. It arrived with a good selection of sandwiches, scones and what I call “funcy pieces”, but as we were due to drive up the road that day we opted for the more sensible coffee and tea instead of the bottle of prosecco. We were also unable to finish our funcy pieces, so the staff kindly let us take them up the road so I could treat my granny. As we started our journey back up the road, it really felt like we had had a proper break. And while I can’t promise I won’t be jet setting off anywhere soon, I will definitely ensure I continue to make the most of what we have closer to home. 30% savings available on two-night stays between 1st July and 31st August 2018*.